The following sections describe these elevation data sources in detail. 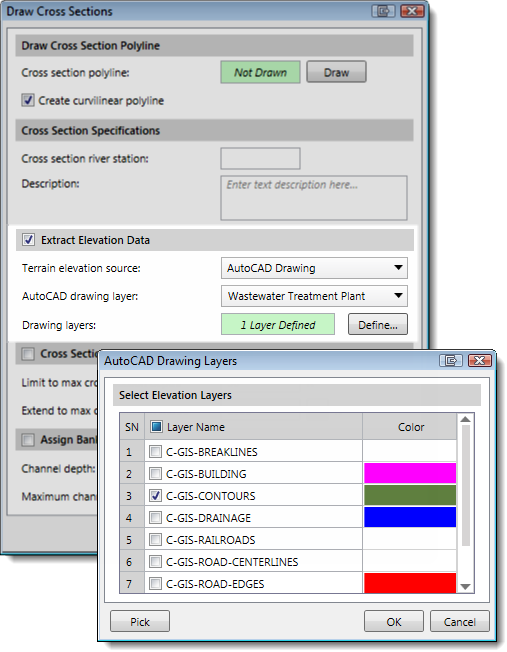 Refer to this section on how to add an AutoCAD drawing file as a data layer. AutoCAD drawing files containing contour lines can be used to determine cross section geometry when cutting cross sections. In the Extract Elevation Data section contained within many of the create cross section dialog boxes, the user can select the AutoCAD layers containing contours for use in extracting cross sections. AutoCAD drawing files containing contour lines can be used for generating a terrain surface for intersecting the computed water surface when determining the flood map and to determine cross section geometry when cutting cross sections. See this section on how to generate a terrain surface. AutoCAD drawing files containing elevation point data can be used for generating a terrain surface for intersecting the computed water surface when determining the flood map and to determine cross section geometry when cutting cross sections. See this section on how to generate a terrain surface. 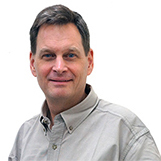 The software can use AutoCAD Civil 3D, Bentley MicroStation, and other TIN surfaces to determine cross section geometry when cutting cross sections. TIN surfaces are imported as LandXML files. 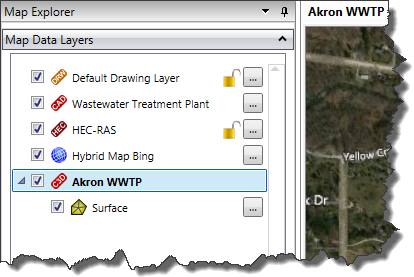 To load a LandXML terrain surface, from within the Map Data Layers panel right-click and select Add Layers from the displayed context menu. Then, select the corresponding LandXML TIN surface file to load. The TIN surface will be loaded and displayed as a layer. The LandXML surface can be used to determine the cross section geometry when cutting cross sections. 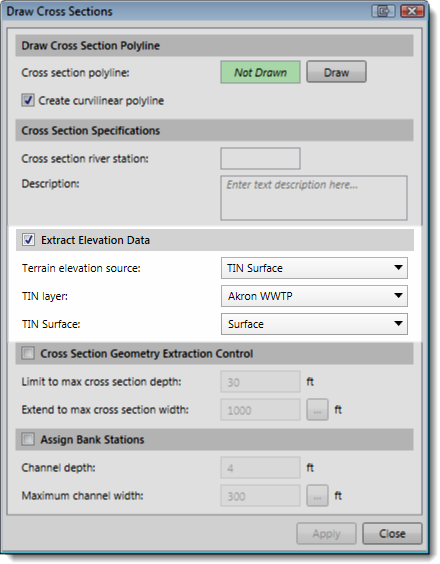 In the Extract Elevation Data section contained within many of the create cross section dialog boxes, the user can select the TIN surface for use in extracting cross sections. Currently the software cannot intersect the computed water surface directly with a TIN terrain surface. The user needs to generate a terrain surface from the TIN surface in order to generate a flood map.